Motivational Thread Feb. 23 - Mar. 1.....progress, not perfection! Good Monday morning Fitday friends! Can you believe by the time we're closing out this new thread at the end of the week, it will be March!! Feeling so happy to see February out and welcome March. Hopefully it brings warmer temps to those of us who have had a long winter. 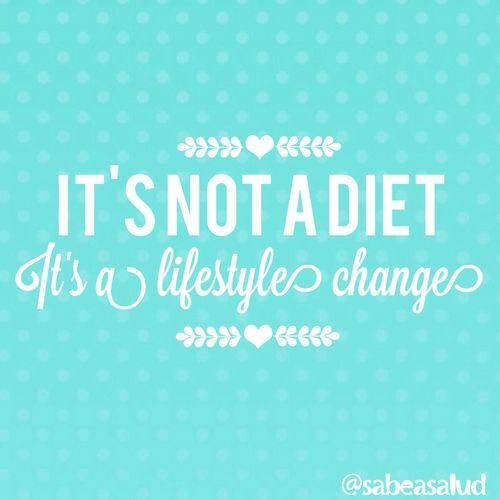 You hear it all the time "....not a diet, it's a lifestyle..." but what exactly does that mean? I think of diet as temporary deprivation and lifestyle as a life long commitment. To me, that means making changes we can stick with forever. Whatever changes you make, they need to be things you can stick to for life. No point in eating 800 calories a day....that's not sustainable. Not point in exercising for hours a day...not sustainable. However, we do need to make changes that are sometimes not exactly comfortable at the beginning....but when practised over time, they become part of our lifestyle. Once those new changes become comfortable, build on them to continue to progress. If you're not currently exercising, try committing to daily walks. Even 20 minutes a day! Once that becomes comfortable, build on it! Cut out or cut back on something in your diet that has no nutritional value, then build on that by continuing to look at your diet and make slow, sustainable changes. Slowly, over time, these new changes become lifestyle. Making change is good, but keep in mine we don't need to be perfect at new changes, but we do need to make an effort. Strive for progress, not perfection! Moderation, not deprivation! Wishing each and everyone of us a successful week at implementing change and striving for progress. Last edited by lildebbieg; 02-23-2015 at 11:25 PM. Lisa, thanks for the idea with the diet soda. I only had one glass of it this week & plus the whole idea of looking at different sugars and how they affect you got me to try stevia. So that will be at least 30 cal less every day - usually have 2 tsp in morning coffee. Just looking at the easter challenge and my current/goal weight (plus I am going to be up tomorrow - great weekend, not so sensible foodwise) it doesn't look like I'm going to get there but I would like to try! Going to up my mileage a bit this week. I'm quite certain I won't hit my Easter goal as well, but I think it's good to set our goals high and then strive to reach them. I'm planning another challenge after the Easter challenge, so we will get a chance to set new goals to strive for. I am a perfect example that the exercise can't be kept up long term, although I would like to argue that it can. As soon as I am able to deal with this tooth, I will get back to daily walks. I can still walk, just not in the early hours when it is still cold. When I want to be out. Starting on March 4th or 5th, I will be walking in the middle of the day for work. Catching up on last week. I did get to the Medieval event for part of the evening. I met new people, watched some sword play, and asked some questions. Good Monday Morning! I'm off to a good start and feeling optimistic this morning. I weighed in this morning at my lowest since Jan 1. I'm determined to maintain this or see it down further this week. No bouncing scale this week! My lifestyle change I'm implementing today is stair walking breaks. I sit at work all day. I'm going to take two 10 minute breaks a day and walk the stairs for the full 10 minutes. I'm hoping that on top of burning calories, this will build muscle and keep my metabolism pumped up throughout the day. I should be able to keep about 10 pounds per year from coming back, just by walking stairs. Provided I keep my eating in check, that is - and I definitely plan to make tracking what I eat part of my lifestyle from here on out. That's where I get into the most trouble - when I'm not aware of how many calories I'm taking in. Hi everyone - thanks for the motivation to start the week, Debbie! Everything looked GREAT on the ultrasound!!!! There's a little baby in there with a strong heartbeat (131 beats per minute), looking normal as can be, and I measured in at 7 weeks and 1 day, which is about where I thought I was. DH and I took a big sigh of happy relief!!!!!!!!! No tears, just a "Yay!" reaction. Good job baby!! Doctor gave me the go-ahead to start exercising again. I may start with just doing some low-impact cardio on the elliptical or some 20-minute workout DVDs that I enjoy. Doctor did warn me not to get my heartbeat above 140 beats per minute, and I tend towards HIGH heartbeat (160 or 170/minute) when I do cardio, so I will have to remind myself not to go all-out and keep it low. I will be glad to start exercising this week. So, here are my goals, modified for the fact that I've got a baby on board, haha! Those should be very manageable goals for me, and if I feel like doing more, I certainly will. Last edited by taubele; 02-23-2015 at 07:03 PM. Reason: minutes, not seconds! I am a perfect example that the exercise can't be kept up long term, although I would like to argue that it can. Maybe I should have worded my opening dialogue...exercising at a high intensity for hours a day is not sustainable...but daily exercise is most definitely sustainable. I meant choose wisely....choose something that you enjoy and can sustain over time. If you enjoy high intensity exercise (I do!!) sprinkle in some lower intensity stuff so you don't burn out. Annette, good job on planning to get back at the walking when your tooth pain is dealt with. You're a tough lady to keep pushing forward while dealing with pain!! My lifestyle change I'm implementing today is stair walking breaks. I sit at work all day. I'm going to take two 10 minute breaks a day and walk the stairs for the full 10 minutes. Love this idea!! I often think about doing this, but have never actually implemented! However, I'm about to change up my usual style of interval workouts to heavy weight lifting, so my legs may be too tired to walk stairs in addition. Maybe I should strive for 2-10 minute walking breaks...maybe when it's not 40 below I can start this! There's a little baby in there with a strong heartbeat (131 beats per second), looking normal as can be, and I measured in at 7 weeks and 1 day, which is about where I thought I was. Fantastic news Terri! Isn't it amazing to see a little baby in there! I was so surprised at my first ultrasound! So happy for you and your husband! Terri, so glad to hear that! Was that 131 beats per SECOND?? That would be a world-record baby, Mike I meant beats per minute, lol! I edited it! Debbie, it was pretty cool to see the little bean, though in my usual way I researched pictures of what it was SUPPOSED to look like to death, so seeing the real thing seemed not quite so different. I think my overwhelming emotion was relief. Very cool to hear the heartbeat, though! We could see it right away as soon as she got the ultrasound stick where it needed to be, and that was cool too. I thought she might have to hunt around more, lol. I've already downed 48 oz. of water at work, plus what I had with breakfast, so I should easily hit my water goal today!